You know those daggy little cobwebs hanging under the verandah or the corner of the lounge room? 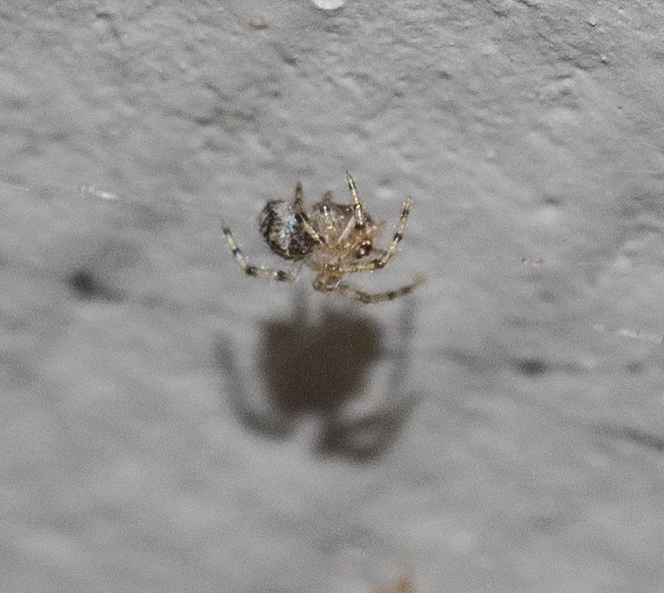 The ones housing small, long-legged spiders and often hundreds of tiny babies? This week I've witnessed something that shines a whole new light on the 'Long-legged House Spider', Cryptachaea gigantipes. We've just had a couple of days of rain. 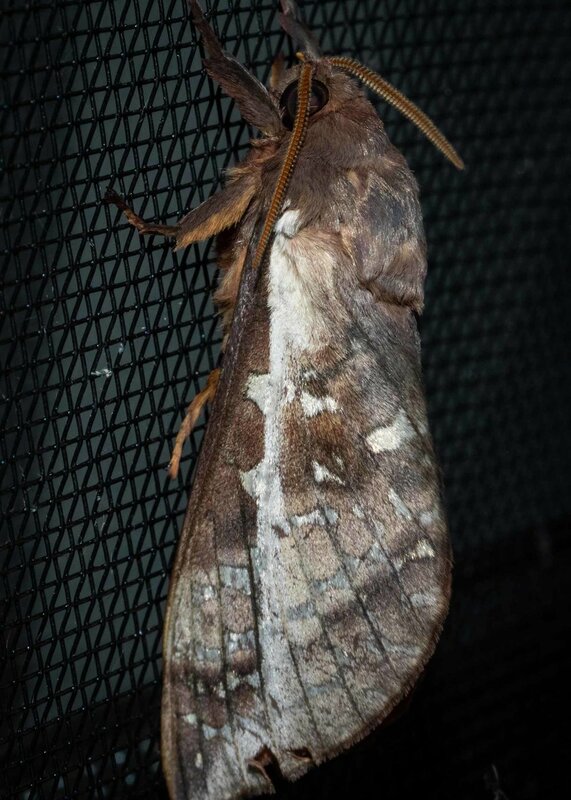 Immediately before and during rain events, moths and other insects are attracted to window lights and the shelter of the eaves. So ... you guessed it! ... I've been doing some nocturnal prowling outside the house, camera and torch in hand. Saturday night it was moths galore! 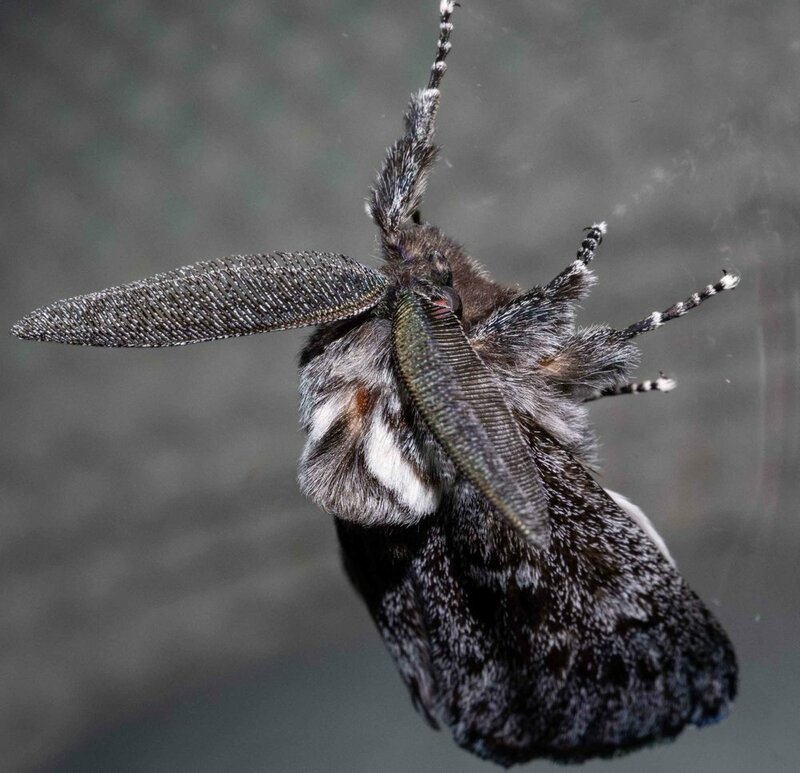 In particular, the spectacular cossid moth Ptilomacra senex appeared en masse! 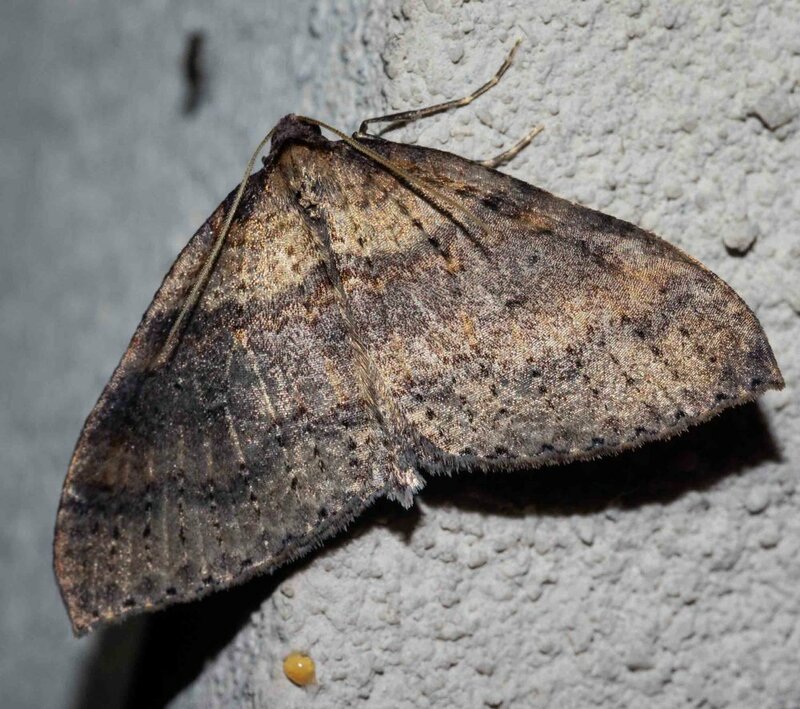 There were also numerous hepialids (Ghost Moths), and various smaller species. Sunday night, however, spiders stole the limelight. The stars of the show were no doubt the trapdoors and funnel webs ... but that is a story Paul will tell in a separate post. It was actually the demise of one trapdoor that caught my attention. 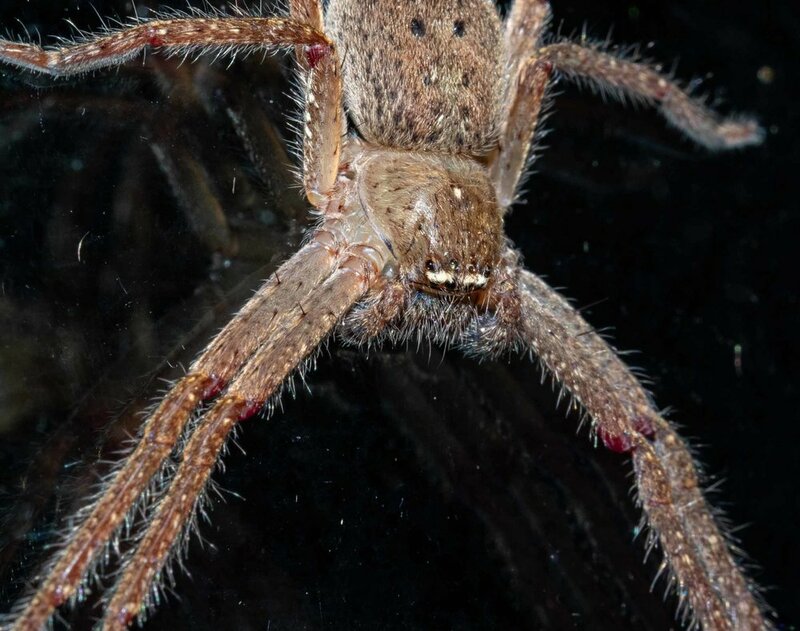 Cryptachaea gigantipes (common names: 'Long-legged House Spider' or 'White Porch Spider') is a native species, common across south-east Australia. Its natural habitat is under rock overhangs and inside caves ... and, now, under eaves and inside houses. 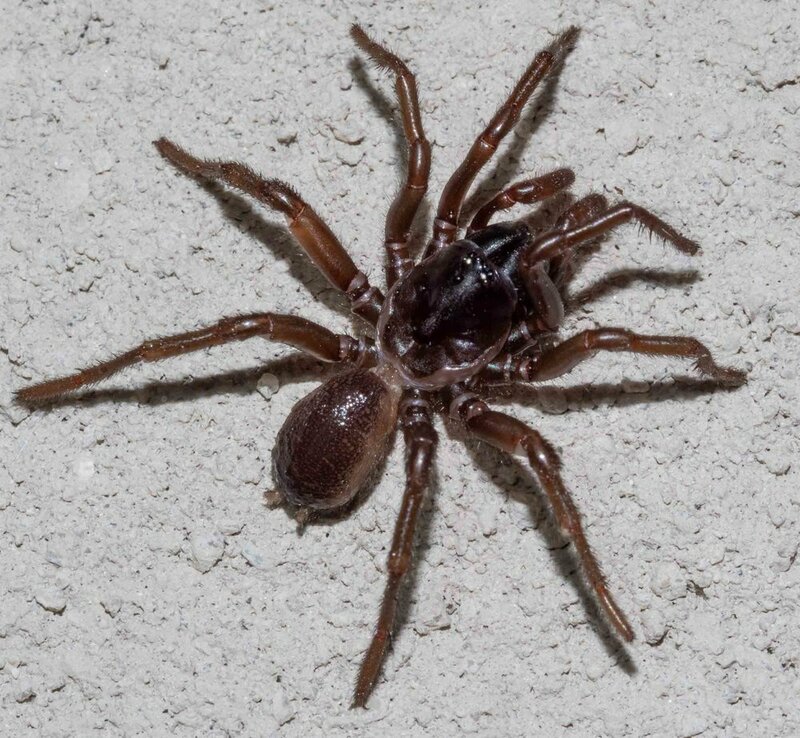 It belongs to the same, large spider family as the Red-back Spider, the family Theridiidae. Unlike its famous cousin, C. gigantipes bites are not dangerous. Well, not dangerous to humans, that is. the anchor point breaks and he's suddenly suspended mid-air! and C.gigantipes strikes! But carefully, and at a distance, taking full advantage of her extremely long front legs. My first glimpse of the action was at this point. The trapdoor was hanging in the web, struggling, and C.gigantipes was circling, laying down more and more silk (the images above). 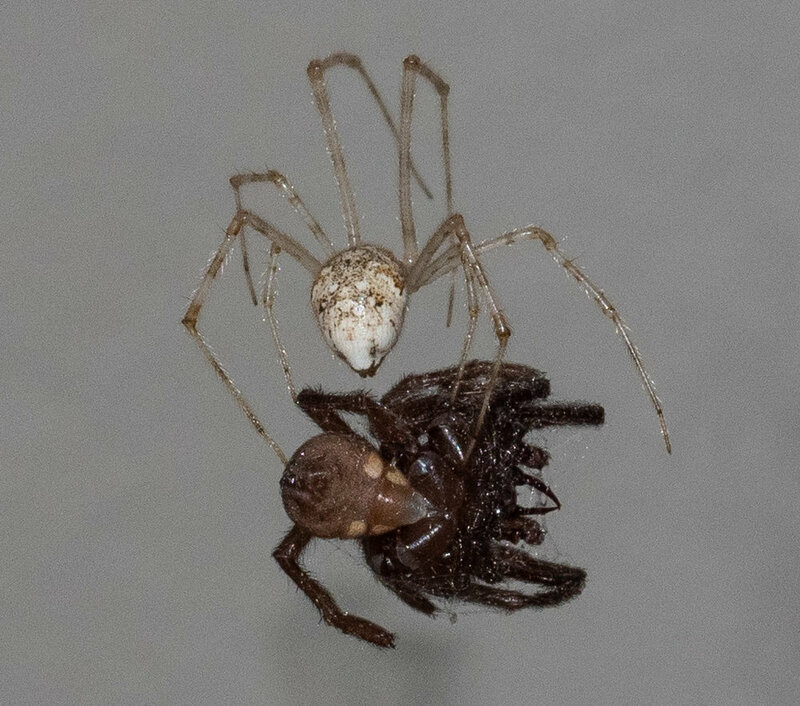 A short time later (images below), she move in and bites! She targets the soft abdomen, staying well clear of the trapdoor's rather impressive fangs. End of story, for the trapdoor. 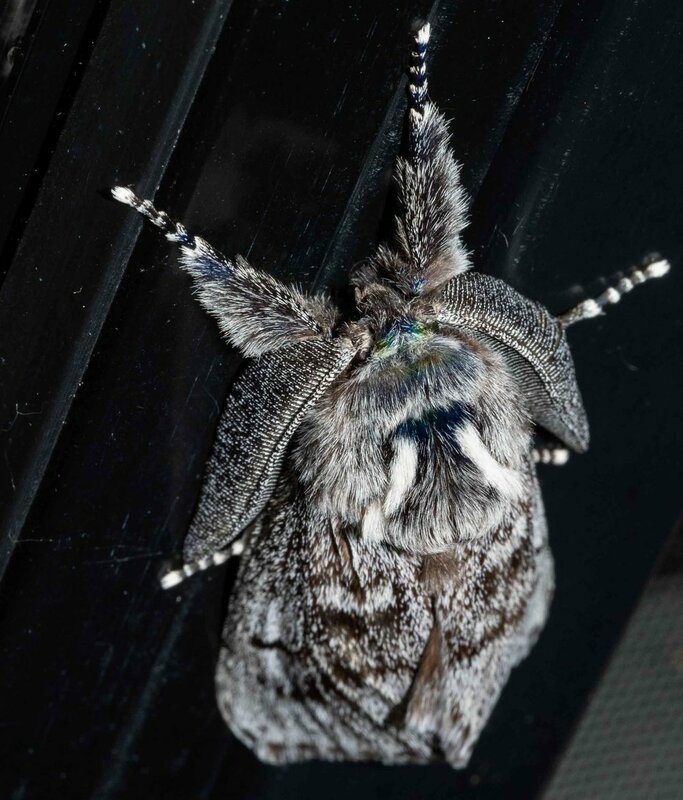 After reading a little about C.gigantipes, I took another look under the eaves this morning. The attacker in the images above was nowhere to be seen, but I did find several other individuals ... including the one below. 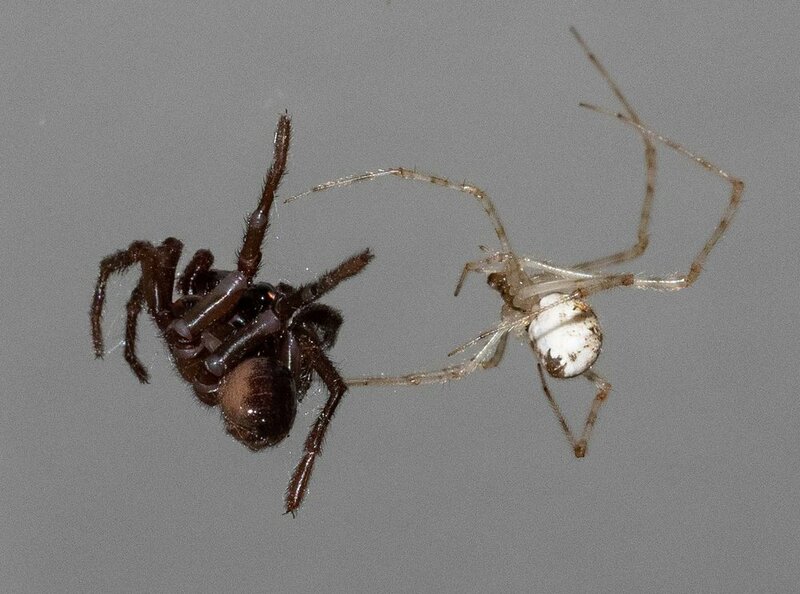 Different spiders, yet same scenario! Seems that more than one local trapdoor fell victim to C.gigantipes this week. This fat-bodied female C.gigantipes appeared to be feeding. She sat motionless, jaws clamped on a leg of her prey, for as long as I watched. The trapdoor was probably still alive, but paralysed and helpless. The web of this particular female is also home to a large number of spiderlings - no doubt, her offspring. Eggs are laid within a silken sac, often surrounded by multiple covering layers. 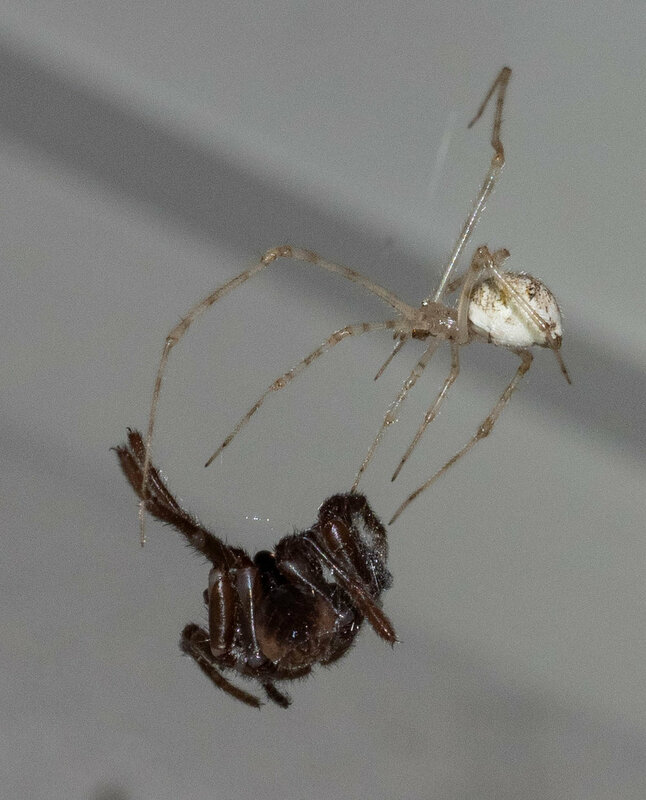 The sac is suspended in the web. 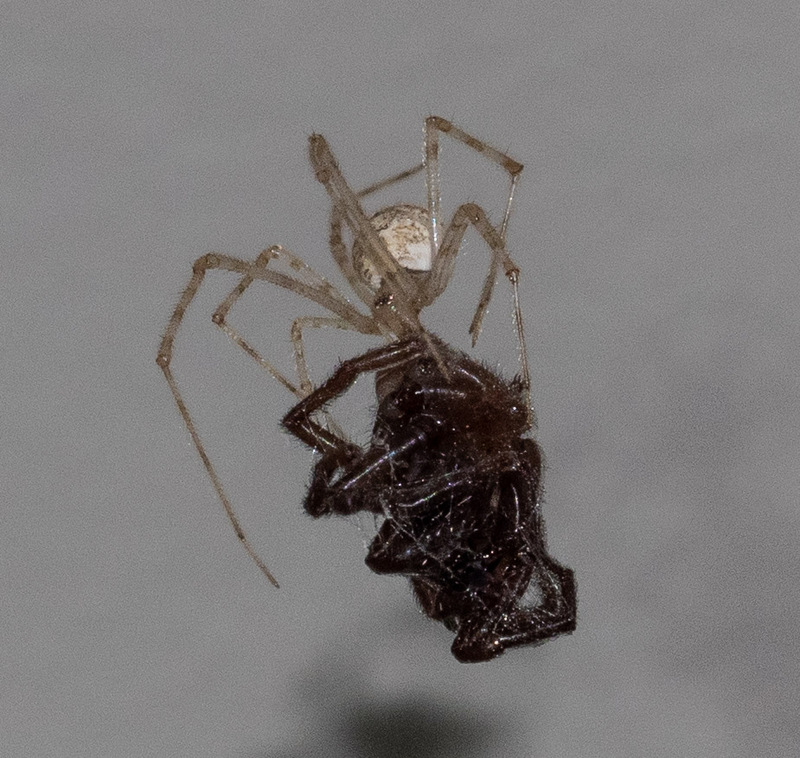 And the web is home to a rather protective mother. Benefits: the eggs and young hatchlings are protected from desiccation, predation and parasitism. 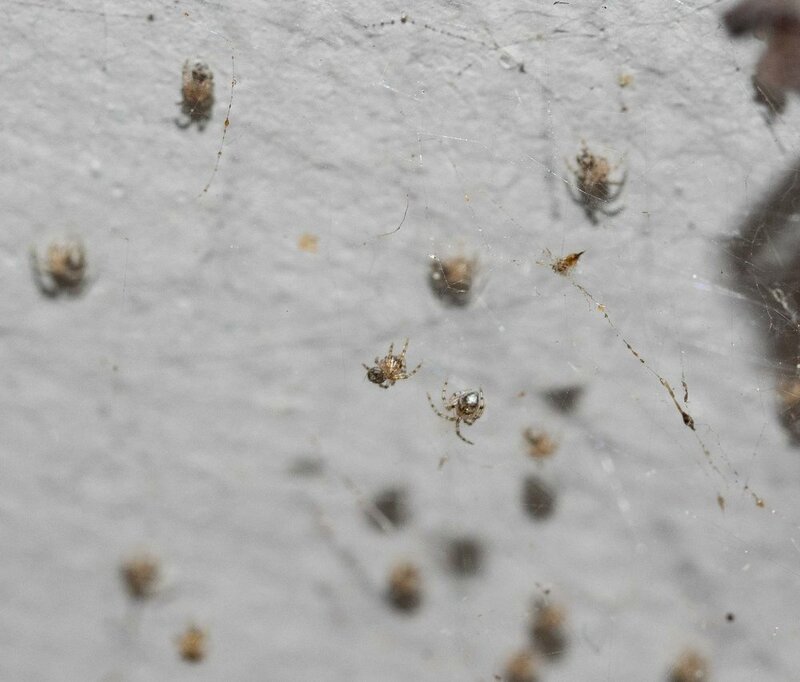 When they are large enough, the mother cuts open the sac and the tiny spiderlings emerge. But they don't go far. They remain in the tangled nursery web, often quite deep within the overall web of the mother. Benefits: protection and free food. 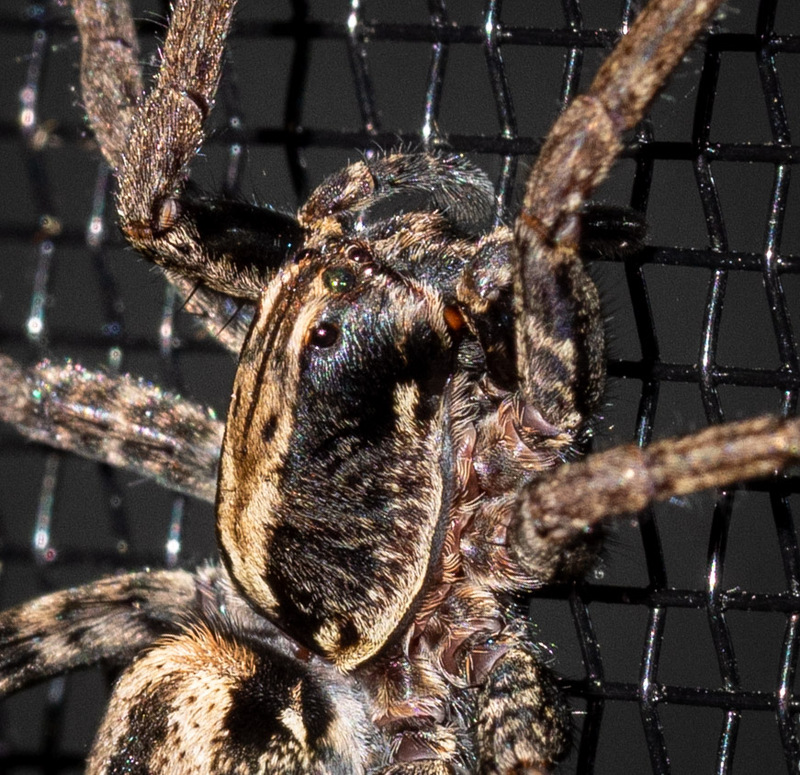 The surrounding web provides protection and is a trap for tiny insects - tiny enough to provide an accessible meal for small fangs. In many species, the mother will bundle paralysed, small prey for her babies. And in some species, she will even regurgitate liquid food for them. I've looked closely at this C.gigantipes family, and have yet to see the babies feeding. There is no sign of them on the large trapdoor their mother is feasting upon. 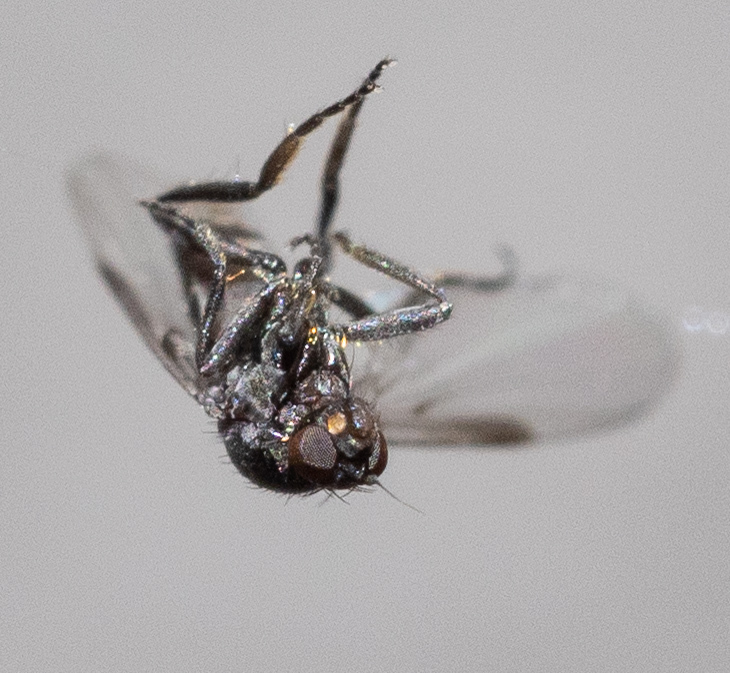 However, there is a very tiny fly trapped in the web, so perhaps they'll discover that soon. Gillespie, R.G. 1990. 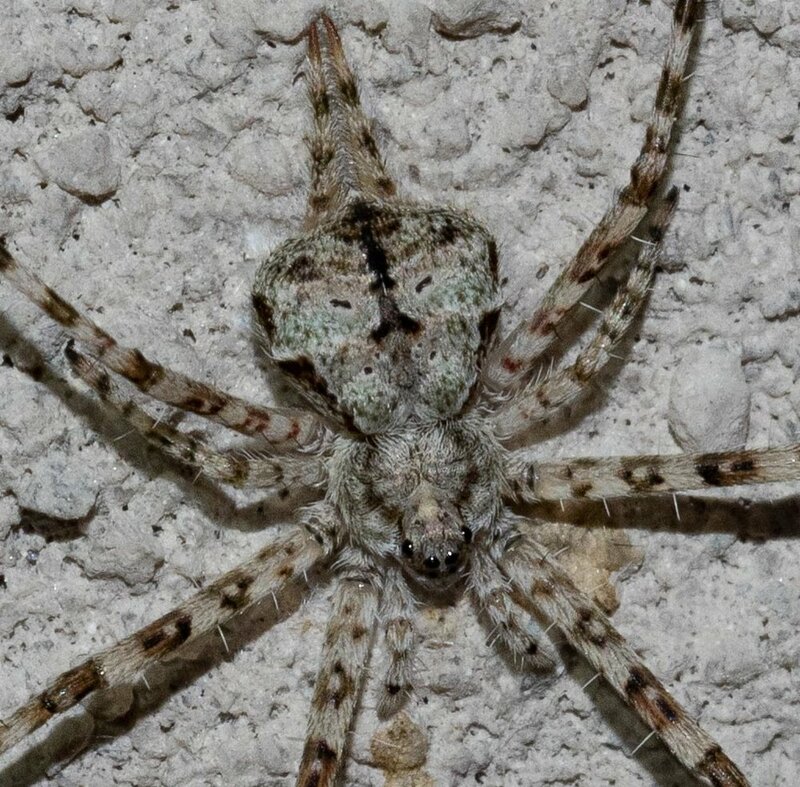 Costs and benefits of brood care in the Hawaiian Happy Face Spider Theridion grallator (Araneae, Theridiidae). The American Midland Naturalist, 23(2), 236-243.